Curry in a hurry? 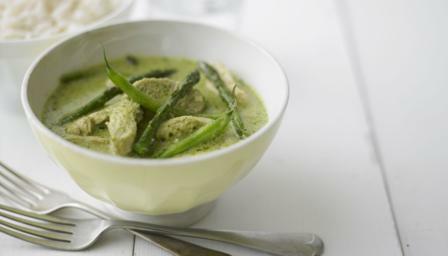 Save time by using ready-made paste in this truly tasty Thai green curry. Heat the oil in a wok over a high heat until smoking. Add the green curry paste and stir fry for 1-2 minutes, or until fragrant. Add the chicken strips and stir until coated in the curry paste. Continue to stir-fry for 1-2 minutes, or until the chicken has browned on all sides. Add the coconut milk, lime leaves, fish sauce and sugar and stir well. Bring the mixture to the boil, then reduce the heat until the mixture is simmering. Continue to simmer for 8-10 minutes, or until the sauce has thickened. Add the green beans and asparagus and continue to simmer for 2-3 minutes, stirring regularly, until just tender. Season with salt and pepper. To serve, spoon the rice into four serving bowls, then ladle over the Thai green chicken curry. Sprinkle over the coriander leaves.